Remember the feeling when you were a child on the way to a funfair? A mixture of excitement and anticipation, butterflies in your stomach? I feel the same walking from the train station to the eight vast exposition pavilions of Maison & Objet in Paris every year. This is the largest interior design show in the world, where manufacturers from across the globe fight for the best stand locations. I never know what to expect and what I will find. It could be a new manufacturer from Japan showing truly amazing textiles one year and fabulous artisan glass accessories from Brazil the next. But this year was different. I had to stop in my tracks when I saw the Villiers Brothers stand, filled with magnificent hand-made furniture from a state of the art factory in the midst of the English countryside. Established in 1989 by three brothers, the company has an international profile, supplying bespoke pieces made by craftsmen for the most prestigious interiors. 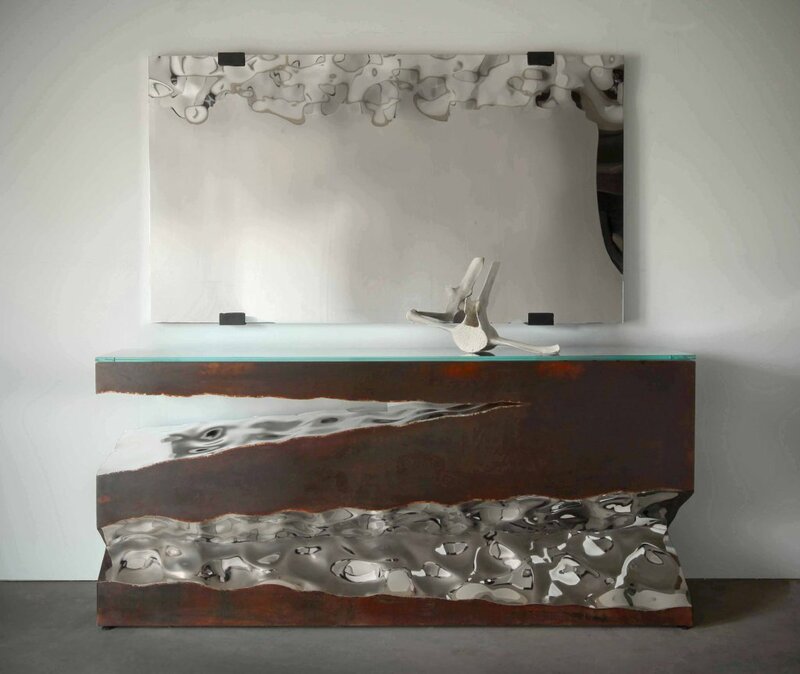 Their latest collection is made from a combination of etched steel with a rust patina and polished stainless steel. The collection is divided into two styles: Strata, comprising single pieces and Elements, where two or more pieces combine to work as a free-standing console table with or without glass, or as a coffee table. The Strata Console can also be used as a coffee table with or without glass. The collection is extremely versatile. Currently the company is working on producing a cubic side table with an entire side in polished stainless steel. The contrast between geometrical lines and natural elements create a magnetism that is hard to ignore. I doubt anybody walked pass these art pieces without stopping and gazing at them, reminiscing about the rocky seaside landscapes they had seen but since forgotten. This evocative collection was inspired by the exposed and hewn rock faces that have become worn over many years of exposure to heat, cold and water that have slowly eroded and polished the rock. Imagine my astonishment when in a different hall I stumbled upon another company, this time from Portugal, which had a collection resembling my first great find. Maison Valentina have produced a Lapiaz bathtub and a wash basin on a free standing base. Lapiaz is the French word for a typical karst formation produced by surface dissolution of limestone or dolomite rocks, caused by freezing and thawing in cold climates. But these artful creations imitating cracks in stone are different. The polished brass details and mirrored sides of the bathtub and wash basin stand would definitely make a statement in the most luxurious bathrooms. Dare to be different and you will enjoy these pieces for many years. This is definitely not just another bathroom! It is uncanny, but lucky for us that these two different companies from the UK and Portugal produced such similar collections. Now you can enjoy this extraordinary design concept in your living room and your bathroom! For more details on these collections, contact Art of Interiors, Hale, Cheshire.